To truly advance in growing into the saint God designed you to be, I highly encourage you to make praying the rosary daily a priority in your life. If you just don’t think you’ve got 20 minutes to sit down and ask for Mary’s prayers as you reflect on the life of her Son, let me find 20 minutes for you :). Keep in mind it doesn’t have to be a contiguous 20 minutes and you don’t have to carry a rosary with you. You have 10 fingers, right? That’s good enough. Here are 11 perfectly good ways you can pray the rosary TODAY even on the busiest of days! 1) In the shower – What else do you have to do in the shower? Praying is much better than letting your mind wander. Keep your eyes on the Lord! If you’re not done praying by the time you’re finished, continue while toweling off, getting dressed and even blow drying your hair. 2) While running – Do you go running regularly? Make praying the rosary your activity instead of listening to music. There are podcasts, such as on the free Laudate Catholic app, that you can listen to as you run. 3) In the car – It’s amazing how I can quickly pray the rosary just going to and from the grocery, while getting gas, taking the kids to school and more. A few car trips definitely add up to 20 minutes. I often use a free CD from CatholicCity, which I pray along with. It makes me feel like I’m praying with a group! It’s also a great way to learn to pray the rosary if it’s new to you (because it can be quite confusing to newbies). 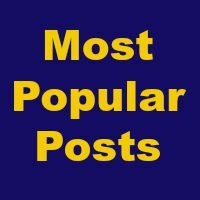 See other free Catholic resources. 4) While exercising – Try the wonderful SoulCore program that pairs core exercises with the rosary. Purchase the DVD and get two important things checked off your to-do list: fitness and prayer. This program has the approval of Lafayette, Ind., Diocese Bishop Timothy Doherty. 5) While cleaning – Pray away as you vacuum, fold the laundry, mop, dust, etc. And while you’re at it, you can bless those who will reap the benefits of your efforts of a clean home and wear those nicely-folded clean clothes. 6) Taking the dog for a walk – Do you walk your dog everyday? Make that your time for praying the rosary. Again, much better than letting the mind wander. Keep your mind focused and make it a fruitful time! 7) At lunch – Take a daily lunch break and sit quietly to pray the rosary. During warmer months, why not pray outside and enjoy the beauty of Mother Nature that God has gifted us with? 8) Try a walking rosary (sans dog) – Once a week, consider praying a walking rosary. You hold the rosary in your hand and walk in rhythm to the prayer. Now, other people may see you doing this, so you have to be a brave and joyful witness. A priest in our parish used to do this in visible spots around town and it was incredibly powerful to see him walking and praying in the public eye. 9) As you fall asleep – I received this once as a penance after confession and what a joy it is to drift to sleep with thoughts of Jesus and Mary on your mind. The only downside to this one is you might fall asleep before you get through the entire rosary! Read Patti Armstrong’s post on what happened when she was too tired to pray the rosary. If I wake up in the middle of the night, I consider it a sign that someone needs prayers and so I’ll pray the rosary until I fall back asleep, offering it for whoever might need it. 10) At church – It’s so powerful to pray the rosary in the presence of Jesus or with others in your parish. Make a weekly date with Jesus to sit in front of the Blessed Sacrament or in Adoration to pray the rosary. Or, if your parish has a practice of group prayer of the rosary, join in! Better yet, start your own rosary group! 11) While waiting – How many times do we wait in a day? Waiting in line at the grocery, at the doctor’s office, in the school pick-up line? Work in a decade each time you’re in line and you’ll be done by day’s end. 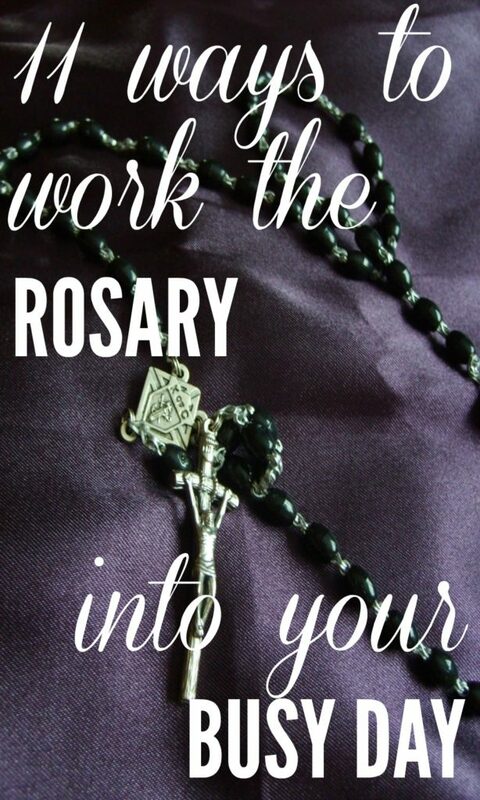 Any other suggestions for ways to work the rosary into your busy life? Thanks for a GREAT post Lyn. And also for linking to my story which taught me that no matter how tired I am, the rosary is worth staying up for. Even if we fall asleep, at least we should get it started. After reading several books on purgatory and the regrets suffering souls have for not taking advantage of the life on earth, I’m certain no one will ever regret making time for the rosary. God bless you! Thanks Patti! My life has been so much more blessed for praying the rosary every day! There’s no reason we can’t work it in if we truly want to. Lyn – thank you for encouraging all of us to incorporate praying the Rosary into our daily lives! This SoulCore journey has definitely opened up the beauty of the Rosary for Colleen and I. When we meditate on the fruits/virtues of each of the mysteries, one cannot help but be transformed into the image and likeness of Jesus and Mary. That’s the beauty of the Rosary – it teaches us how to imitate them in our everyday lives. Thank you for sharing your wisdom on this beautiful prayer! Lyn… Very nice post. So interesting that you list running. I have several customers that buy our rugged rosaries which are made out of military paracord (cordbands.com) just for when they run! My husband is a marathon runner and says he wouldn’t be able to do that while concentrating on his run, but apparently a lot of people can and do. Very cool! I had not heard of rugged rosaries — can you email me a pic? lyn AT catholicnewbie.com. Thanks for commenting! What I have found to be very helpful, since I spend most of my time alone and in my room, is to pray the rosary with a rosary cd, either an actual one or audio ones online. I mainly use ‘ Scriptural Rosary ‘ and say it along with Melissa. Not only do I feel as though I have company, but it is lovely saying it along with someone else, even though it is only her voice. On my breaks at work I go up and down the stairs, 5 flights, saying the rosary. I get both a mental and physical break and I am always revived. Very useful tips. Now I don’t have any excuse for neglecting my rosary. So trite and yet a little reminder jus brings it back into focus and as a wake up call. Bravo. I always try to pray the rosary every day as Mary asked us to do in Fátima. When I have not a rosary I pray with my fingers any time I can, even looking at Nature. When I go to bed and have not prayed the rosary that day, I ask forgiveness to Mary and pray three Holy Marys, because I know I would start to sleep. But it’s true we feel so much Peace after praying the rosary. Thanks so much for sharing Isuara! I too most often just pray with my fingers 🙂 I like your idea of asking forgiveness as you are falling asleep and offering three Hail Marys. Wonderful :). Thank you for this wonderful article. I have started listening to the Chaplet of Divine Mercy and the Sorrowful Mysteries of the Rosary while I sew. We’ve had a few family members pass very recently and I find it’s easier for me to focus on my intentions for prayers if my hands are busy; my mind doesn’t wonder as much. Because this is the last thing I do before bed, I fall asleep still hearing the singing and the prayers in my head, as well as wake up with the Lord on my mind as well. It has given me an incredible peace and I now look forward to hearing, singing, and praying along with all tasks that my hands know how to do, but I don’t need to think about so I can focus on my prayers and intentions. What a wonderful way to pray! Thanks for sharing, Sherry! My one problem with praying the Rosary without beads is that I can’t keep track of how many Hail Marys I have prayed! Even using my fingers, I get confused. But several years ago, I came up with a method of keeping count of the Hail Marys in my head: I assign some point of meditation to each of the 10 numbers, for every mystery. For example: while praying the Annunciation, during the 1st Hail Mary, I will consider that the ONE true God came from heaven and became man for our sakes; then, that Our Lady carries out the TWO great commandments, love of God and love of man, in saying “yes” to the Lord’s call; next, I consider that there are THREE persons in one God, and that each person is active in the Incarnation; then, I consider how the FOUR marks of the Church are related to Our Lady’s conception of Christ (the 4 marks being, one, holy, catholic, and apostolic); then consider that this Child will suffer the FIVE wounds at his death…etc., etc. When I pray this way, I am able to stay focused, and my meditations are beautiful and fruitful! Others are: John Chapter SIX, on the Eucharist; the SEVEN Gifts of the Holy Spirit; the EIGHT beatitudes; the NINE days of prayer before the coming of the Holy Spirit; the TEN commandments. There are many variations of numerical memory devices; a person could even use numbers from his or her personal life. For instance, if you have FOUR children, you could choose to consider their lives in light of the particular mystery when you reach the 4th Haily Mary. It may seem cumbersome at first, but it’s been a great help to me, to be able to pray the Rosary while doing dishes and other house chores. I think this is genius, Rose! I may write a whole post on it :). Thanks so much for sharing! !